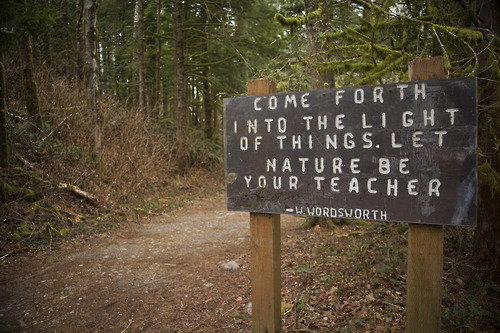 There have been numerous attempts at reconnecting with nature, and seeing nature as part of our physicality/psyche, especially when understanding the self and the power of knowledge by allowing our own nature to teach us. The unfortunate rise of dominant religions have forced millions of old religious ideologies to disappear, only to be brought back, more predominantly during the Industrial Revolution. With physics, biology, philosophy and medicine developing into something far greater, and the ongoing feud between religion and science, only a famous few sought the power of Nature in times of need, creativity and devotion. Some people, as I will detail in another essay, hid their ‘pagan and hermetic’ philosophies’ in plain sight, going as far back as medieval Britain, the Renaissance and the period of the Enlightenment. A few poets took a particular interest in writing about Nature as a separate entity, with an emotional tie to every individual who ever lived. William Wordsworth is one prominent writer who often described nature as his lover and teacher, and as I will detail below, his judge. Seeing nature for what is, seeking the emotional power one perceives from it, allowed people to realise their own ambitions once again, as we will see. As you have just read, the power Nature has over the emotions of this young narrator caused him to flee back to the shore and run home. He is haunted by the image of the rocky hill, as if it knew what he had done. The narrator details how Nature can peer right into his soul, and pull out emotions from differing ends of the spectrum, as lust and fear/paranoia. Funny enough, the next stanza beings with, ‘Wisdom and Spirit of the universe!’ – Nature has power, and it’s a matter of recognising it, and working with it, either by science (predicting the weather etc.) or spiritually (by symbolism and philosophy). Whilst most households during this time were predominantly Christian, this poem reflects the worship and love affair the narrator has with Nature as God. As most Romantics and the Enlightened, found the old classical philosophies about life, death and Nature incredibly inspirational. This is partly why so many classical works have remained today, as there is a valuable and shared truth behind the idea of living a life where you have total control. These ideologies were shared freely from master to student, ensuring the student would later become the master. This idea had caused problems during the destruction and adopted ideals of the pagan world in favour of controlling old religions under one, or several, titles. By taking away the basic rights to individualism, or living will, the modern religions allowed themselves the power of controlling mankind under one shared belief in an all supreme deity, who would/should be far greater than Nature. This idea of “controlling the masses” had become warped, as it was no longer about working together to defeat an enemy or entertainment, it was about actually controlling what people thought, how and who they had to worship (be it God or a priest), and the notion that thinking outside of the box was a wrong. Man slowly became disconnected to nature, and went on living without much hindrance to it, unless it was spoken of with a Christian translation – like I said, feigning the idea the Nature was weaker, and under total control by God. Referring back to the understanding of the poem, and if you get a chance to read that passage (details and link below), the narrator makes a note of how Nature was, and still is, a part of his human consciousness, or psyche. The fact that a craggy hill, which doesn’t do much besides lay still and erode, has the metaphorical ability to have consciousness and peer into the narrator’s soul, suggests we humans share something with Nature. This thing can be interpreted as magick. As the narrator insists throughout the poem, he sees Nature as a temple, the lover, the teacher and as a Universal deity. Understanding then, that if the Universe (personification of the supreme deity) is a vital part of your psyche, it must then mean that we have the ability to work with, and be part of Nature because we are born with it within. It is tapping into that magick and allowing ego to teach us how to live with it, which causes so much panic and fear in the controlling environment. As long as Nature allows us to think and feel for ourselves, we will ascend from a primitive base to the stage of master. I will go into further details about how understanding magick, and how to use it at a later date. Thank you for taking the time to read my essay – it is only a small part of something I have been working on for some time now. Categories: 108 Days of Thought, Hermeticism, History, Magick, Occult, Paganism, Poem, Thelema | Tags: esoteric, Esoteric and Occult, Hermeticism, Occult, Paganism, Religion and Spirituality, Sy Calaelen, Thoughts, Writing | Permalink. My pagan past hasn’t been all bad, in fact it has been amazing. I have pushed myself to go beyond places I always heard were bad. Thelema and the occult being two examples. We are conditioned from a young age, to what is correct and what isn’t. If you analyse the impact the New Age has had on people, you will find a pool of mixed experiences, but a lot of those experiences seem to follow the trend of conforming, and to another degree “aesthetic purposes”. These days I look at myself and feel good just being myself. Being free, being open and being proud of how far I have pushed myself. Things that seemed hard to begin with are now second nature, and I’ve benefitted hugely. Hard work is one area I found easy, and it also played a big part in the decision of leaving my Wicca days behind. I must admit, I choices I made were based on ideals I hadn’t really thought about. As time went on, with my spirituality deepening, I found a sense of realism and understanding, in fact a whole lot more than what was available. Around the time I went back to practising general witchcraft, I noticed the bigger picture. It was as if I had seen a tiny rip in the fabric, just flapping in the wind, as if beckoning me to rip it apart. Let’s just say I ripped at it, and slowly the world it revealed was full of beauty, power and knowledge – a kind of Eden. Amongst the thorny bushes, there would be a cornucopia of rare flowers, and I knew I would have to work my way through the thorns with bare hands. I didn’t mind. I’m a hard worker, with a keen soul and devoted heart. This is what I feel is missing from underdeveloped practices like Wicca – there aren’t goals to work toward. From my own experiences, I was running around in circles, just spending my time bowing down for the sake of habit. Then there would be days when I read the exact same thing, just written by another person, and quite happily digested it without question. It was a case of the blind leading the blind. 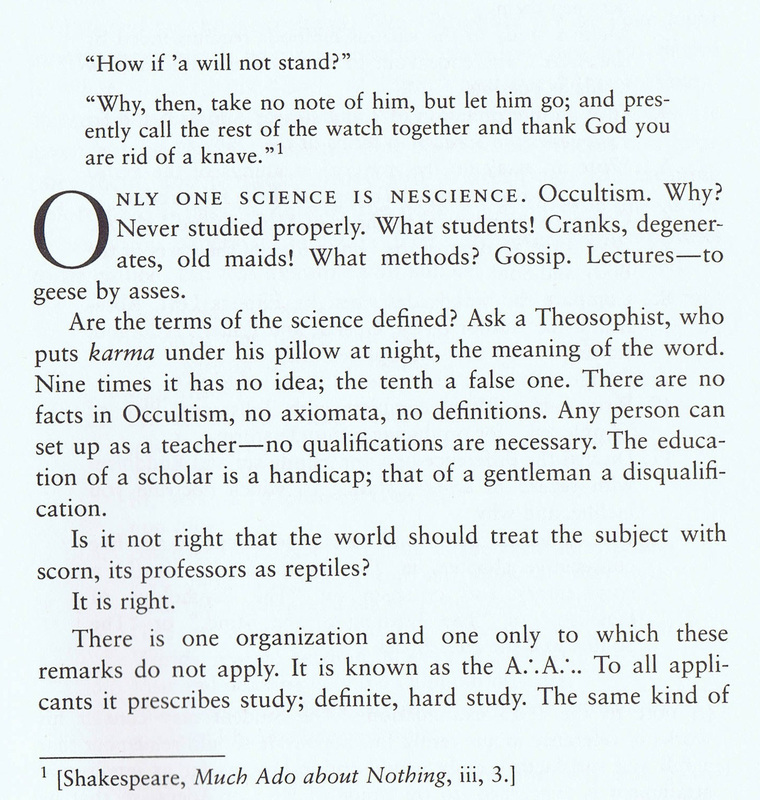 I remember reading my old books and coming across passages dedicated to slamming the occult, and things beyond the circle. At the same time, I came across these attitudes on the internet. All kinds of people would slam the serious practitioners for thinking differently. These days I get the odd comment, or email from someone who has read my blog or watched one of videos who will try to put me down for following a system that is thousands of years old, but only made available in the last century by Crowley. People want a quick fix, so they find false teachers and follow them, only to realise after a lot of energy has gone, that they were duped. They eventually find their way back to the people they originally thought less of, or look at spiritual subjects with a new eye. Everyone must follow a path set for them, but how they choose to follow it is a choice only they can make. When I joined the YouTube community, I had experiences with socialising I had never gone through. I won’t go into too much detail, as I have done a lot in the past! I had worked out what the trends were, and stayed well away. I looked up to people, who I considered to be normal humans like me, but with better understanding on certain subjects. I also found a lot of others, who unfortunately continue to gas, who did a lot of talking, and never shared their own experiences – considering half of the folks who vlogged after a well-known vlogger went on a huge break, were only there for subscriber numbers, and not quality. I saw the shallowness of these people and quickly decided to just keep doing my thing, regardless of how boring my videos were. I didn’t care about the quantity, I only cared about documenting my progress for my own memory. Even today, I haven’t vlogged in ages because I’m busy being a university student, and being a Thelema student. I hate the idea of ever becoming an armchair magician, which is why I don’t vlog or write unless I have successfully experimented, or experienced something. Sadly, people like me are ignored and often over-looked due to our raw love of magick. We don’t like quick fixes, we love to endure the hard work and ordeals, because we know exactly what we will gain – truth, balance and another step on the ladder of transcendence. Those are qualities you can only find outside the New Age phenomenon. Then again, that’s just my opinion. The amount of people I have met who left Wicca and other New Age formations behind for something deeper, truer and purer is astonishing! They learnt what they needed to, and moved up a class. I’m doing that too; experimenting, and increasing my knowledge pool. I needed to go through those days, in order to find out what I do not want in my future. It was one ordeal after another, but they have been worth it. In some big way, I feel great knowing my hard work paid off, and my persistence to stay afloat meant I was able to find absolute balance. I’m more confident because of it, and I can look in the mirror and smile at myself. It’s great. Mourning is over (for now). Categories: 108 Days of Thought, Lessons in Life, Magick, Occult, Paganism, Thelema, Wicca | Tags: Crowley, Esoteric and Occult, Magick, New Age, Occult, Religion and Spirituality, Spirituality, Sy Calaelen, Thelema, Thought, Wicca | Permalink. This will be a super weird post, as it’s something I haven’t thought about too thoroughly. However, it does revolve around my personal education as a magician and Thelemite. More than ever, it’s a lifelong lesson I know I must endure, and it’s a very personal one at that. These last few posts have seen me looking at my past as I’m currently analysing what has happened. I guess I’m preparing myself for an in depth chapter of my life, which I feel will be part of the making of my character. Most people come to a point in life when they’ve made a positive, and drastic change to their lifestyle and their beliefs especially. I am no exception to that prevailing device. When I made the decision to stop being Christian and Jewish I was young and didn’t mind. The transition was fairly easy, looking back. I was a preteen with a big ambition, a big heart and a love for something more than what I was brought up to believe. I knew something bigger was out there, I just didn’t know what. It was around that tender age that my God complex and base philosophical ideals started to show signs of development. G-d was something more. When. I found witchcraft everything seemed fine. Sure, I had to keep my books and tools a total secret but that’s all part of the journey. Later came Wicca, and I made a nice comfy seat inside the broom closet. I learnt a lot about the general basics of witchcraft, and learnt the observances and religious ideals from Wicca. Again, my deep roots within philosophy and questioning were quite apparent, and soon I found the roadblocks and hypocrisy within a free religion that revealed no freedom, and it didn’t teach me about ascension – don’t get me wrong, it’s a lovely path, but I hated staying in one place and blaming myself for it. The denial and the pressure to conform to an ideal that wasn’t actually ideal made life difficult. I wanted to be part of something true, as I made a ton of friends, but for me it wasn’t something that sat well within my heart. I put all my intentions into the universe and it replied by sending me down other paths whilst continuing to carry the Wiccan flag. This continued until the occult made herself known, and especially until I found Thelema. The transition I’ve gone through in the last year has meant I have seen and experienced things I had never thought truly possible. The philosophy of Thelema, Hermeticism and such alike have really shaken my foundation. It’s good to have the odd shake once in a while – it really forces you to stop and just smell the coffee. I found I would ask myself each week what I believed and why. Some of my occult ad pagan buddies found my new found home quite intriguing, and thus I felt I could open up. Some have actually requested titles I have enjoyed, and I have been generous in recommending all kinds of material around Thelema and the occult. A few friends have actually turned to Thelema as it serves as a foolproof philosophy that instills freedom, rigidity and a truly personal connection to the universe. There is a goal to not only achieve, but it also shows a lot of people the truth about who they are. Maybe I’m wrong, but without Thelema I wouldn’t have reached the plateau I have. I’m unable to fully accept the amount of anger that grew once I began studying harder. The unfulfilled and empty wishes. In fact, I stopped performing spells years back, and stuck with ritualised formulas instead. I’ll probably make space to perform small spells in the future… Maybe not. My transition was mostly positive, but boy I felt like I screwed myself terribly during my “denial days”. To this day I’m still weary of practices from my past, especially as such practices are on the rise. My toughest life lesson is following Liber LXXVII so wholeheartedly. At first glance it looks so easy, and once explained makes a whole lot of sense, but the more I look at it the more my past rears it’s ugly head. Is that normal? To feel disdain toward the unfulfilling elements of my past? I’m shocked by how angry I am toward it all. I assume it’s some kind of purge? I have this annoying trait which means I want to help everyone – I know I can’t. But the idea of just letting someone fall without even attempting to help them bothers me. I’m a big softie! People are free to do as they please, especially if they are happy as they are. I have no right to show them any other way. It’s how their life is supposed to run. Sometimes that’s a great reminder to just stay out, but sometimes it’s a painful thing to watch. It’s a lifelong lesson all right. I guess what I’m trying to point out also, is the fact that you must stay rigid even when you feel utterly sour and useless. Sometimes you have to “lay back and just let people walk all over you as it’s their Will,” as one friend wrote me recently (thank you). When do you stand up for yourself, without shoving your beliefs down their neck? It’s all rather complex and simple all at the same time. That’s all I can think if right now, but I am thinking about how to approach the very sensitive issue of Wicca from a Thelemic point of view without offending all Wiccans’ or pagans. Maybe that’s another ponder post for the future. I haven’t been making a great deal of sense with my musings or theories. I just hope I figure it all out soon! Categories: 108 Days of Thought, Annoying Thoughts, Lessons in Life, Magick, Occult, Paganism, Positivity, Reincarnation, Thelema | Tags: anger, Life, Occult, Pagan, past, personal, Sy Calaelen, Thelema, theory, transition | Permalink. Is There a Particular Occult Mould? In fact, most occultists I have spoken with have told me various texts or moments of inspiration have shown them they can’t denote the term “pagan” to their individual practices. For me, it was a few texts that changed the way I approached my beliefs, and the way in which my practices evolved for the betterment of my soul. I had intended on yet another monotone look into my past and the events that sparked such virility, but instead I thought I would turn my attention to aspects of a different style of thinking, and what makes my occult life seem educational and refreshing. Most people who have written to me always run on the assumption – a normal mistake – that being pagan immediately equates you with a certain kind of knowledge, presence, “style” (to some degree) and a free pass to all occult and witchcraft facilities without much guidance. It’s a tough road, believe me, I’m still living it now. Take pictures for example, so many images pop up (in books or on the internet) that can allure any curious mind, but with most occult imagery the details are hidden, or written about using language that may seem too conservative and convoluted for most students. It is hidden knowledge after all – only you can find the answers. You, and you alone. This is where I found a divide. Some folks (a very small number) will dedicate time and energy to teaching themselves and seeking teachers/friends to gain diverse insights into such images, thus building a solid base of knowledge, beliefs and personal practices. I have found, being one of these types myself means I have met a lot of other people with differing ideas on difficult subjects. Many of whom have shown me an awful lot, and others I have been able to share my ideas with quite easily – without too much detail. The way I chose to perform and exercise my daily magick meditations means I can create a formula that suits me, in effect creating a solid mould. The amount of occultists I have spoken to have expressed an underlying paranoia amongst members, and I’m slowly beginning to see where it all may stem from: the lack of strict practice and vigilance within occult circles, and the sad attempts at watering down occult knowledge for New Age paganism. It is almost as if true occultists want to protect what scripts we have from being “tainted by the fairy unicorn”, as one friend put it. I believe most practitioners should have a right to study these texts, and I also firmly believe that the majority of practitioners can learn a hell of a lot about themselves and form newer or better philosophies. 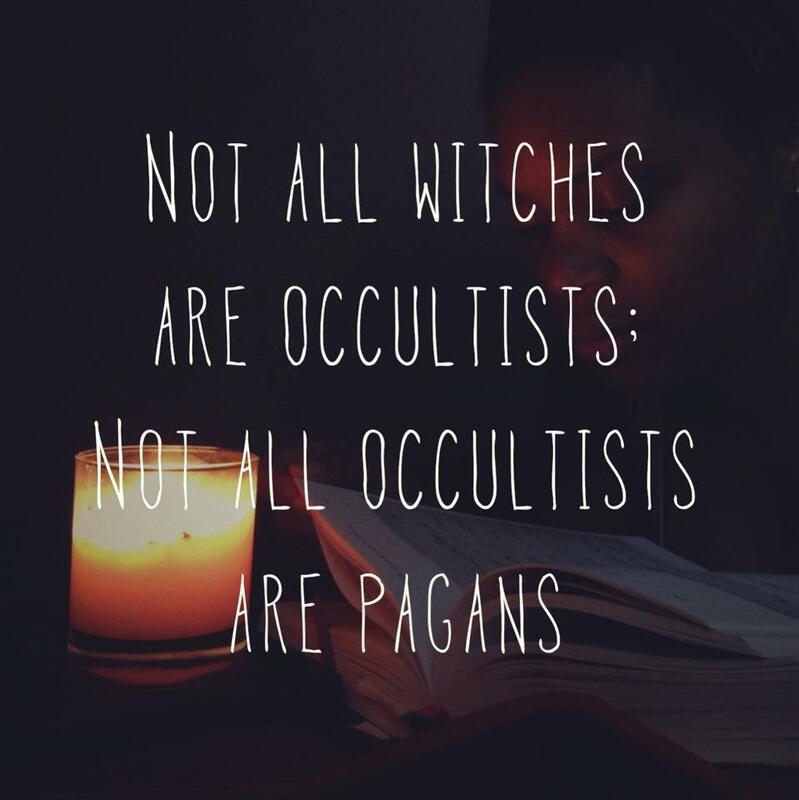 At the same time, I hate seeing people run around claiming to be occultists without knowing the basics. I get a ton of emails from people stating how they’re considering the Ambramelin operation, or summoning those that shall not be named from the Keys when they don’t even know what the LBRP is. It’s all for show, and it’s quite strange. If anything, the occult is not a show so stick with the New Age moulds – you can’t go wrong with them. You can apply style and special effects to that other stuff, but all that does is allow the ego to have greater precedence over your higher self. Categories: Annoying Thoughts, Lessons in Life, Magick, Occult | Tags: Esoteric and Occult, knowledge, Life, Magick, New Age, Occult, Religion and Spirituality, Sy Calaelen, Thelema | Permalink.